Ingredients: cereals * (34%) (rice *, wheat *, oats *, barley malt syrup *, cane sugar *, sea salt), corn syrup *, grapes * (13%), apricot * (13 %), hazelnut * (8.5%), honey *, deodorized oleic sunflower oil * (antioxidant: rosemary extract *), acacia fiber *, natural organic apricot flavour *. Allergens: Presence: gluten, nuts. Possible traces: egg, milk, soy, peanuts, sesame. 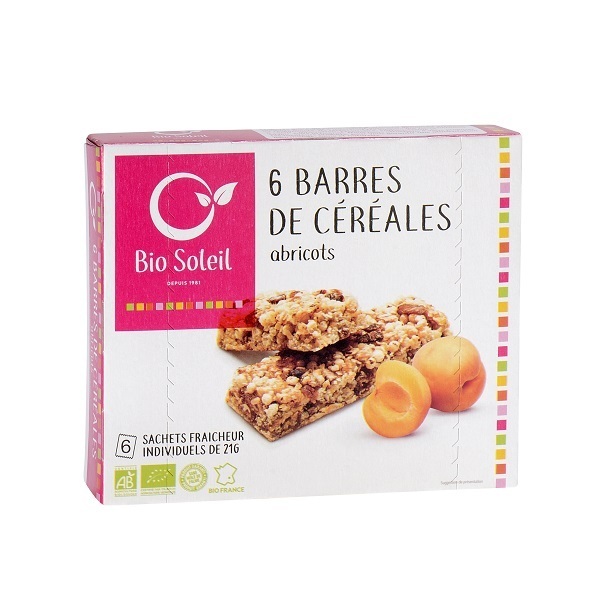 Around the late 70s, in the heart of a natural region, an artisan ahead of his time who lived in harmony with his environment invented his cookie recipes, including the famous macrobiotic cookies, and created the Biosoleil brand. In 1985, when the AB label was created, Biosoleil had already long been on the shelves of organic grocery stores. In 1991, BIO SOLEIL settled in Annecy, a commune located in the Rhône-Alpes region in south-eastern France. From the beginning the company has claimed its independence, sense of traditional values, and its commitment to the organic industry, its different role-players and to the consumers. For over 30 years, Bio Soleil has created, developed and enhanced hundreds of recipes for the whole family to enjoy!